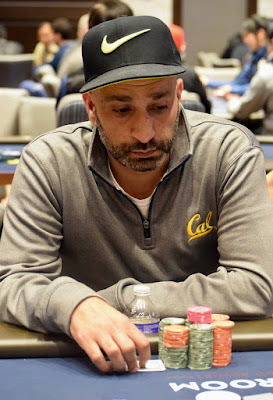 All in preflop with Pocket_Fours, Hafiz Khan is called by start-of-final-table-chipleader Sean Marshall, who is holding Ace_Ten. The 5-A-6 flop puts Khan behind, but adds a backdoor straight draw. The draw goes away with the Q on the turn, and the J river eliminates Khan in 8th place, a $16,935 cash. Khan has now cashed for more than $340,000 in TVPokerRoom tournaments in the last 2 years, including these finishes.